If you're a fan of that overdriven Marshall stack tone that was the basis of Eddie Van Halen's famous "brown sound", then you'll definitely want to check out this pedal! 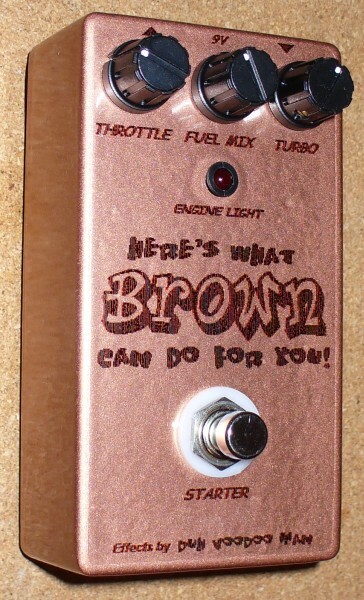 Despite the UPS-based name and labeling theme I gave to mine, this is just a straight, no-frills build of General Guitar Gadgets' "Brown Sound in a Box 2" pedal, or BSIAB2 for short. This design was conceived by a gentleman named Ed Guidry, and uses an array of five JFET's to generate a very convincing Marshall distortion tone. Making the pedal even more attractive is the fact that it's amazingly cheap for a complete kit. GGG charges a mere $60 plus shipping for the BSIAB2 kit, and even puts it on sale for 10% off from time to time. 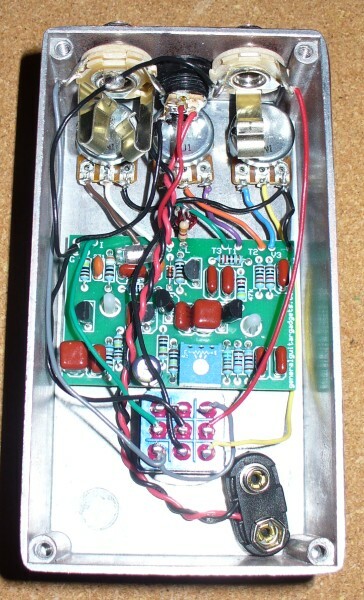 It's quite a simple build, and the ingenious GGG layout uses the space in the enclosure very economically. Overall, a great sounding distortion pedal at a bargain price! Build yourself one and start working on those fiendishly fast tapping runs in the intro of Hot for Teacher!